When will be Whammy! The All-New Press Your Luck next episode air date? Is Whammy! The All-New Press Your Luck renewed or cancelled? Where to countdown Whammy! The All-New Press Your Luck air dates? Is Whammy! The All-New Press Your Luck worth watching? "The game with big bucks and Whammies is back, Bigger and better than ever! It's time to play, Whammy! The All New Press Your Luck!" This 2002 Game Show Network original is a revamped version of the classic CBS game show, Press Your Luck. Todd Newton is the host, and Gary Kroeger is the announcer. Gameplay is largely the same, but there are some differences. Gameplay starts at the brand-new big board. The three contestants are given $1000 each and a chance to win even more by taking a spin on the board. Play passes down the line of contestants, who can either choose to press their luck or freeze if they think they have enough to win the round. They can win money, prizes, and even a car. But, they must watch out for the dreaded Whammy, who for this show was almost completely redesigned. If they land on a Whammy, they'll lose all their money and prizes earned and they'll be knocked out of the first round. The second round is the question round. 5 questions are asked, one at a time. The players are given the opportunity to buzz in after the question is read and provide an answer. That answer then becomes one of three possible answers for the remaining two players. A correct buzz-in answer gets them three spins; a correct multiple choice answer gets them one spin. The third round is the final round, and it's back to the Big Board, and the stakes are higher. There are even more prizes and money just waiting to be won. There are also Whammies, and now there are even Double Whammies, that not only take away a contestant's prizes and such, but now the contestant has to deal with stuff being dumped on their heads. The player that's in the lead at the end of the round is the only one to keep all their cash and prizes that they earned. They can pass their remaining spins at any time during their turn if they have a fear of the Whammy, and just like on the original, four Whammies, double or single, will put them out of the game. 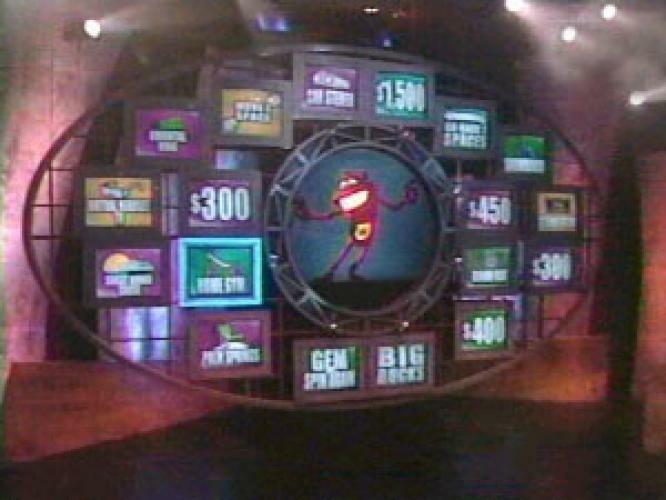 Starting in the second season, a new "Big Bank" feature allows the players to take all the cash and prizes stolen by the Whammy. If they land on the Big Bank space on the board, and answer a trivia question carefully, the winnings are theirs. Whammy! The All-New Press Your Luck premiered on April 16, 2002 and ran until July 26, 2003 on the Game Show Network (now GSN). Though the show is no longer in production, reruns can still be seen. EpisoDate.com is your TV show guide to Countdown Whammy! The All-New Press Your Luck Episode Air Dates and to stay in touch with Whammy! The All-New Press Your Luck next episode Air Date and your others favorite TV Shows. Add the shows you like to a "Watchlist" and let the site take it from there.